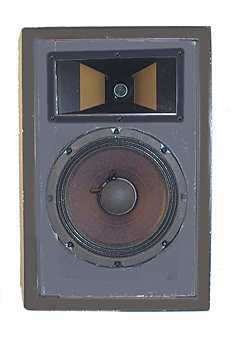 a) Closed miniature speakers (just big enough to fit the drivers); but then a subwoofer up to 150 Hz is needed (picture left and right). 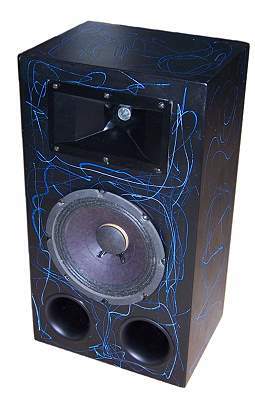 b) Bass reflex speakers with 15 litre volume and two bass reflex tubes. Frequency range is from 65 Hz. (The speakers is slightly taller than pictured since two bass reflex tubes are beneath the bass driver). Dennis Frank succeeded quite well in designing a loudspeaker kit that offers an excellent sound and consists of affordable components. Considering the price this speakers shows an astonishingly flat frequency response. The EAPT 150 tweeter is a perfect fit for this speaker. Just the top frequency range is slightly boosted, otherwise the speakers sounds really great. like pictured on the left. The crossover kit come with high quality components; the building instruction is included. L7 = 0.39 mH, C6 = 1.5 uF, C7 = 3.9 uF, .7 to be bridged and C8, R8 remains free.